Ooooh the dirty rat for spells I always dreamed off? Does this help against big priest at all? 6 mana cost is pretty heavy for a tech card though. For Priest, could also pair well with Madame Lazul or even chameleos. Helps you weigh up how good or bad things could go for you before you play it. Impossible to judge at this point. If there is a spell based burn deck it might be a good tech option, if the game is more board centric probably not. But I'm looking forward to some Trolden videos of this card pulling the coin. 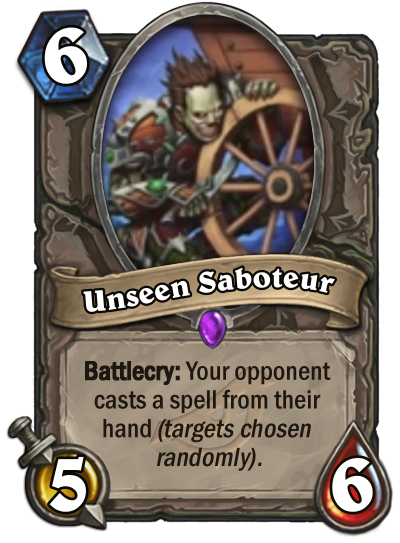 He literally takes the wheel from your opponent. wow...looks like a good and fun card. Might be worth it to keep the coin..
wow Dirty Rat for spells. Looking at this card, there is only one thing i really want to say "Hi trolden" Can't wait to see those Pyroblast going own face winning games. Finally some more otk tech. thus and the mech can help you deal with otk aa a control deck which is great. Yours truly, but mine only. What happens when it pulls something that can't target anything? like necrium vial? will the spell just be gone? If this selects a secret that is already in play, will it just discard it ?